Francis Joseph Parater was born into a devout Catholic family on October 10, 1897, in the city of Richmond, Virginia. His parents were Captain Francis Joseph Parater, Sr. and his second wife, Mary Raymond. Francis, Sr.’s first wife died as did several children she gave birth to by him. Mary Raymond was raised as a devout Episcopalian and communicant at Saint John’s Episcopal Church on Church Hill (where Patrick Henry made his famous speech). Since, at the time of her marriage, she agreed to raise any children born to them as Catholics, she decided she could do that best by becoming Catholic herself. Frank was baptized at Saint Patrick’s Church on Church Hill, the highest of Richmond’s seven hills. He grew up the context of his own close knit family and of the large Catholic community in that Church Hill neighborhood at the time. Frank’s father was a city employee who cared for the park across from their very modest home. He also took care of the garden at the Monastery of the Visitation located two blocks from their home. From their home Frank could easily walk to the monastery for daily Mass at which he served as an altar boy from the day of his first communion until he left Richmond for college. The Sisters of the Visitation, had an academy where at the time Frank’s two sisters, Marie and Grace, were educated. Frank was educated at the Xaverian Brother’s School (currently Saint Patrick’s School) and at Benedictine High School in Richmond. He graduated in 1917, top in his class and valedictorian. In his late teens, Frank became very active in the Boy Scouts of America. His involvement was so exemplary that he was asked to serve in roles of leadership even at his young age. A remarkable young man, Frank was known for his ideals and practical judgment. Although small in stature, he achieved the rank of Eagle Scout. At a time when the Catholic faith was not considered to be a social asset, Frank was well thought of by Catholics and non-Catholics alike. In fact, newspaper accounts note his achievements, his natural talents and his gifts of heart and mind. His vocational choice to study for the priesthood, his journey to Rome, his untimely death and his Last Will and Testament received coverage far beyond what one might expect for the times. 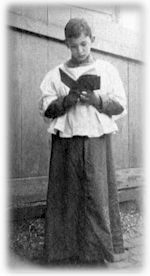 During this period, he continued to go to Mass and receive Holy Communion daily, prayed the Rosary and Memorare daily, and went to confession weekly in accord with a Rule of Life he had drawn up for himself. He had an abiding sense that “…the Sacred Heart never fails those that love Him.” The Benedictine Fathers made him aware of the spirituality of the Little Flower, Saint Therese of the Child Jesus, O.C.D. While at the college seminary, Frank made the decision to study for the diocesan priesthood. This decision was made with the assistance of his spiritual director and after discussions with the Right Reverend Denis J. O’Connell, D.D., Bishop of Richmond. Frank decided that there was such a great need for priestly ministry in his native Virginia that he would forego his desire for monastic life in favor of direct service to the people of God. During the summers, while at Belmont Seminary College, he was active in the Knights of Columbus summer wartime activities for youth and was director of the summer camp for the Boy Scouts of America. The leaders of the Scouts saw such virtue and ideals in Frank that they wanted him to serve as a summer camp director supervising those who were his seniors. He was considered a “four-ply scout”, exceptional in every way. In addition, he wrote an “Open Letter to the Scouts of Richmond” marked in a similar manner. The Act of Oblation to the Sacred Heart of Jesus was not discovered until after his death on February 7, 1920, when a fellow seminarian, Frank Byrne, of the Diocese of Richmond went through his effects and found this testament. In late January 1920, Frank came down with rheumatism that developed into rheumatic fever causing him tremendous suffering. He was taken to the hospital of the Blue Nuns on January 27. The spiritual director of the college, Father Mahoney, explained to Frank that his illness was grave and he administered the Last Rites to him. Frank wished to get out of bed and kneel on the floor to receive Holy Communion as Viaticum, but was prevented from doing so. With devotion and unafraid of death, he knelt on the bed and made his last communion. On February 6, Monsignor Charles A. O’Hern, rector of the college, offered the Mass of the Sacred Heart for Frank. Frank Parater died on February 7, 1920. He was buried in the College Mausoleum at Campo Verano. His Act of Oblation was discovered after his death. Two popes have asked for copies of it, and it has been published in English and in the L’Osservatore Romano in Italian. In 1920, both city newspapers and the Bishop of Richmond, Most Reverend Denis J. O’Connell, D.D., praised the virtues of the deceased seminarian, the later holding him up as a model for seminarians. Decades later in the 1960’s, a bishop of Richmond, who had been a fellow student with him, the Most Reverend John Joyce Russell, D.D., named a summer camp for Frank Parater and procured various items from his family to be kept in the diocesan archives. The present Bishop of Richmond, the Most Reverend Walter F. Sullivan, D.D., having received authorization from the Holy See, has initiated the cause by establishing a Tribunal to examine the reputation for holiness of the Servant of God Frank Parater, Seminarian. 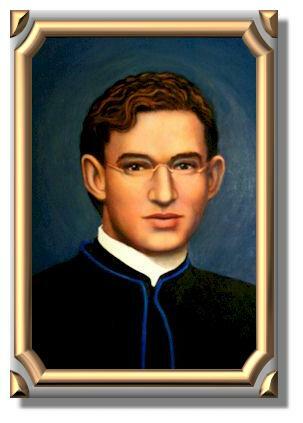 Father J. Scott Duarte, J.C.D. of the Diocese of Richmond is the Postulator.